I recently picked up a 6-pack of minis from China Glaze’s Holiday 2016 collection, Seas & Greetings. 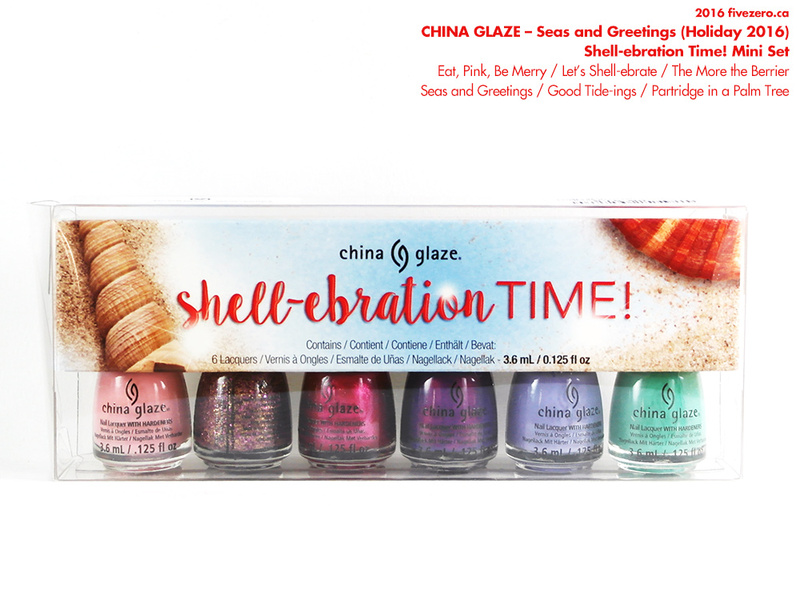 China Glaze Nail Lacquer Mini Set in Shell-ebration Time! Good Tide-ings (83786, though the mini has a different code) is a pastel periwinkle cream that falls right in between purple and blue. It is very slightly greyed, which gives it a touch of dustiness. Not the most winter holiday-inspired color, nor the most unique shade ever. Pretty, though. Coverage is good and quite even, especially for a pastel. Two coats give full opacity. These colors are kind of a dime a dozen, but since the formula is nice, I’ll give this a thumbs up! China Glaze Nail Lacquer retails for US$7.50 and is 0.5 US fl oz / 14 mL. China Glaze nail polishes are free of toluene, added formaldehyde, and dibutyl phthalate (DBP), and are made in the USA. This is just laziness and borderline bah humbuggy!